The HTC One series phones all come in a distinctive rounded huge pill-like box, which is perhaps an attempt by HTC to change up their packaging to something a bit more eye-catching. If you're not a fan of the box, then you'll be even less of a fan of the material it's made of. It lies somewhere in that gray area between paper and...thicker paper. Not quite cardboard, and definitely not a recipient of that glossy sheen you see on fancy retail boxes, it tends to undergo cosmetic damage fairly easily. So, if you're planning on holding onto the box for longer, be sure to tuck it away in a safe place as soon as possible. But enough about the box - on to what's inside. What we have here is your traditional combo; earbuds, USB cable, a small novella worth of documentation, an A/C adaptor and a CD we assume contains more documentation. The HTC One V measures 120.3 x 59.7 x 9.2 mm and weighs 115 g. It's slightly larger, but thinner than its predecessor - the HTC Legend. While the distinct chin under the display is not for everyone, it undeniably makes the phone stand out. The device is your typical unibody that feels extra strong with that rough metal texture .The inside of the chin is textured slightly differently, for a brushed metallic look. The One V comes with a standard 3.7" capacitive LCD screen displaying 16 million colors. And while it doesn't have the Super AMOLED or Super IPS LCD2 screens found in its One series siblings, it manages crisp colors and decent contrast. It also has above average viewing angles and good sunlit legibility. And here are the results of our traditional display brightness and contrast test. Above the display is the earpiece alongside some hidden proximity and ambient light sensors. 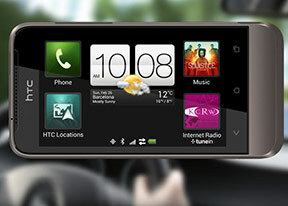 The phone is designed around the now standard for HTC three button configuration. These buttons are haptic-enabled capacitive keys, and are located on the same elevated platform as the display. From left to right they are Back, Home, and Task Manager. The sides of the device are sparse, with just the volume rocker located on the right side, and microUSB port on the left. Along the top of the device are the 3.5mm audio jack and, a thin status LED, and the Power/Lock key. On the bottom you'll find just the microphone pinhole. The back panel contains the 5MP camera lens and the LED flash along the top. The lower half of the rear slides open to grant access to the memory card slot and SIM compartment. It's made of a slightly different type of plastic than the rest of the body, and feels a bit more rubbery to the touch. It also has a small grille for the speaker located underneath. The microSD slot is hot-swappable while popping in a SIM card will prompt a restart. Inside the HTC One V shell sits a 1500 mAh battery. Here's how it did in our dedicated battery test. You can find more details about it over here. The One V's lack of a dedicated camera shutter key is a slight disadvantage, and it doesn't have the Legend's optical trackpad to do the job either. A front-facing camera may also be missed, particularly if video-calling is your thing. That being said, the feature-set is quite robust and the build and finish can rival many premium droids. 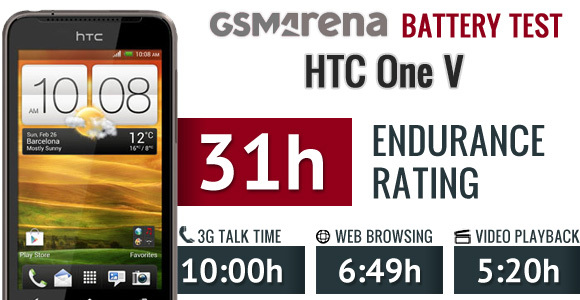 It has a slick although recycled unibody design from HTC, which nonetheless has loads of character. Ergonomically, it feels great and fits the hand very well, while the weight is just right - not too heavy and not too light. The cool design is accompanied by an even cooler ICS interface. Join us on the next page as we examine the software powered by the latest generation of Android.